Kaufland continues to pursue its sustained commitment and relies on reusable trays in the fruit and vegetable sector instead of disposable ones. Since 2003, the customer has seen his or her fruit and vegetables in green reusable Euro EuroGrade systems in Germany. Initially, cooperation was limited to Germany only. Between 2014 and 2015, the cooperation with the Czech Republic, Poland and Slovakia was successfully expanded. Since the end of 2018, the green returnable packaging of the logistics service provider Euro Pool System has become the standard packaging for the fruit and vegetable logistics of the Kaufland stores throughout Europe. Meanwhile, both companies are also working together in Croatia, Romania and Bulgaria. "Through the use of Euro Pool System reusable packaging, in 2018 Kaufland has reduced its CO2 emissions by around 35,000 tonnes per year. The additional countries will be able to save around 42,000 tonnes of CO2 by 2019," says Stefan Lukes, Head of Purchasing Fruits and vegetables International. 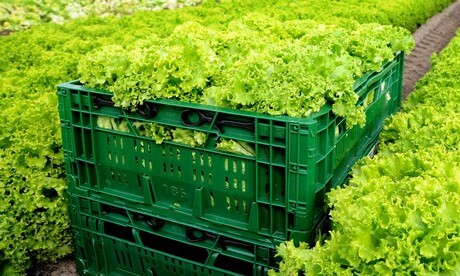 Starting at the producer, via the distribution center to the presentation of goods in the market, the fresh produce remains in the Euro Pool System crates. As a result, disposable cartons are mostly dispensed within the European logistics chain. "Through the Europe-wide change, the sustainability of delivery processes at Kaufland is increasing enormously," says Lukes. "Furthermore, damage to packaging is avoided and valuable resources conserved at the same time." At the beginning of April, Kaufland Poland received the "Sustainability in Retail Award 2018" prize in the Food Retailer category as a special award. The company has been honored for promoting sustainability and exceptional commitment to conservation. The cycle of reusable crates and Smart Return Logistics Euro Pool System delivers empty and cleaned reusable packaging to producers who fill them with fruit and vegetables. Euro Pool System collects the empty reusable crates from the Kaufland distribution centers and delivers them to one of the 70 Euro Pool System service centers in Europe. In the service centers, the reusable packaging is cleaned according to strict specifications, after which it is reintroduced into the logistics cycle. Since 1 March, the return process has been significantly simplified with the introduction of Smart Return Logistics. With this concept, returnable packaging will be handed over to Euro Pool System unsorted. All reusable crates are now equipped with a QR code to ensure a transparent return chain. Smart Return Logistics not only supports traceability, but also helps the employees of Kaufland by eliminating sorting.